This article has been provided by Datawise Solutions Electrical. GFCIs (Ground Fault Circuit Interrupter) are required across Canada in different areas of homes and businesses. I could write a whole article about the building code requirements and interpretations but for now, I want to focus on the myths and realities surrounding GFCIs. A GFCI is an electrical device that measures the flow of current between the hot and neutral wires that power whatever’s connected to the circuit. When there is a current flow imbalance between the wires, the GFCI “trips”, cutting off the flow of electricity. It assumes the current is going through a person to the ground, so cuts the flow off to reduce or prevent injury. Here are some myths and realities about GFCIs. 1. A GFCI can be used to protect computers and other sensitive electronic equipment. GFCIs are not designed to protect the equipment connected to the circuit. A GFCI’s sole purpose is to protect a human from an electrical shock. If there is an equipment problem that trips the GFCI, it could theoretically prevent further damage, but that’s not what it’s there for. Computers and electronic equipment should be protected by installing a surge suppressor to protect against high voltage spikes or an Uniterruptable Power Supply (UPS) to protect from low voltage (brown outs). 2. A GFCI is better at protecting wires than the breaker because it trips at a lower level. A breaker’s job is to protect wires from being stressed by excess current. Even when a GFCI breakers are installed, the overcurrent and fault protection elements are separate. 3. A GFCI receptacle provides a ground for an old style two-wire circuit. 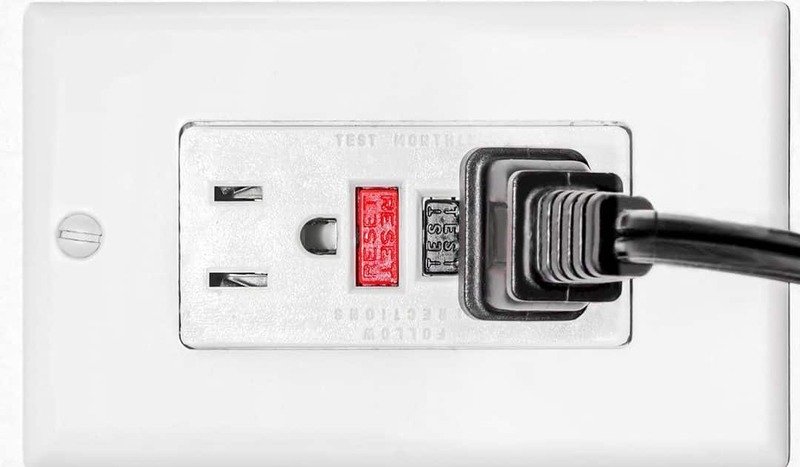 Although Rule 26-700(8) of the Canadian Electrical Code (CEC) recommends the installation of a GFCI when replacing ungrounded type receptacles, a GFCI does not provide a ground. Anything connected to the GFCI or further downstream on the same circuit remains ungrounded . Consult with a reputable electrician for advice on replacing or upgrading receptacles on old two-wire circuits. 4. A GFCI will trip if I drop my hair dryer into the sink or tub full of water. Electricity and water don’t mix. When the two meet on a GFCI protected circuit, the GFCI will normally trip. Sometimes, it won’t. In newer construction or renvations where the water and drain lines are plastic, the sink or tub can act as an insulator, meaning there is no direct path to ground for the current to flow. You can think of this as a plastic bucket sitting on something not touching the ground. In cases like this, a GFCI won’t detect a current imbalance between the two wires so it won’t trip.This doesn’t mean the installation is faulty. It just means there is no direct path for the current to flow. In most cases, if the water was flowing or if you got caught between the sink and a grounded metallic object, the GFCI would trip and save your life. 5. A GFCI will prevent you from getting an electrical shock. GFCIs are manufactured to detect relatively tiny imbalances of no more than 4 milliamps (mA) of current. However, it’s still possible to be shocked before it trips. There is an excellent presentation called Understanding GFCIs produced by the National Electrical Manufacturers Association (NEMA) that illustrates the threshold at which you could still be shocked. Fortunately with a GFCI, even if you get a shock it shouldn’t be strong enough to cause harm most of the time. You probaly won’t even notice if it does happen, and that’s a good thing. 6. A more expensive GFCI receptacle or breaker is better than a cheap one. There are quality differences between GFCIs produced by different manufacturers. Even though GFCIs are supposed to be manufactured to the same specifications, they’re not equal. As a contractor, I’m the last guy who wants to spend more money on name brands if they’re all the same, but I will, because GFCI receptacles and breakers from major manufacturers tend to be more robust compared to no-name suppliers found online when it comes to multiple trip and overcurrent situations, as well as more durable during hard usage and exposure. My advice is to look for names like Hubbell, Leviton, Pass & Seymor, and so on if you’re planning to purchase GFCI related products. 7. A GFCI will save lives. A properly installed GFCI receptacle or breaker will save your life when you’re in a hazardous situation they are designed to protect you from. The Canadian Standards Association (CSA) and Underwriters Laboratory (UL) have done research showing both injury and death has decreased since the introduction and increasing use of GFCI devices. GFCI breakers and receptacles are life-saving devices and should be treated as such. While they might seem easy to install or replace, I recommend you seek advice from a trained professional to ensure it’s installed correctly. The last thing you want is to be killed because the device that was supposed to save you from dying was improperly installed. This article has been provided by Datawise Solutions Electrical. If you need help with a GFCI or other electrical needs, contact them directly. Click here for their contact information.